Travis talks with Zinta Aistars at WMUK ! Travis receives a 2017 Fellowship from the North Carolina Arts Council! Sweetgirl is a Library of Michigan selection for 2017 Michigan Notable Books! Sweetgirl makes Book Riot's Favorite Novels of '16 Pod! Sweetgirl is on The Center for Fiction's Long List for First Novel Prize! Sweetgirl makes All the Books Best of 2016 Halftime Show! Travis on The State of Things with the legendary Frank Stasio! Travis shouts out three current favorite reads! Travis stops by Midwestern Gothic! Sweetgirl's Audiobook is an Earphones Award winner! #2 on Harper's Best Debuts of Spring list! Pop Matters with a brilliant, epic write-up! Fantastic Sweetgirl shoutout in MTV News! Richard Roundy with a super-smart take at Monkeybicycle! Sweetgirl is a state of Michigan bestseller for the month of February! In the beloved Indy Week ! Thank You Reader's Digest UK! ​Fantastic review from the UK! Great write-up on a fantastic event coming up in Salisbury, NC! More love from Paste Magazine! Sweetgirl now #8 on the Great Lakes Bestseller List! Travis talks to Tyler Kane at Paste! ​Best Books of the New Year! The St. Louis Post-Dispatch is on board! Feature in the Petoskey News! The Charlotte Observer provides the best blurb ever! In The News and Observer! As the first thick flakes of a blizzard fall, sixteen-year-old Percy James sets off to find her mother. For years, Percy has taken care of herself and her Mama, Carletta -a woman who's been unravelling for as long as her daughter can remember. Fearing Carletta is strung out on meth and won't survive the storm, Percy heads for Shelton Potter's cabin, deep in the woods of Northern Michigan. A two-bit criminal, as incompetent as he is violent, Shelton has been smoking his own cook and grieving the death of his beloved Labrador, Old Bo. But when Percy arrives, there is no sign of Carletta. Searching the house, she finds Shelton and his girlfriend drugged into oblivion - and a crying baby girl left alone in a freezing room upstairs. From the moment the baby wraps a tiny hand around her finger, Percy knows she must save her from neglect - a split-second decision that is the beginning of a dangerous odyssey in which she must battle the elements and evade Shelton and a small band of desperate criminals, hell-bent on getting that baby back. Knowing she and the child can't make it alone, Percy seeks help from Carletta's ex, Portis Dale, who is the closest thing she's ever had to a father. As the storm breaks and violence erupts, Percy is forced to confront the devastating nature of her mother's affliction and finds her own fate tied more and more inextricably to the baby she is determined to save. 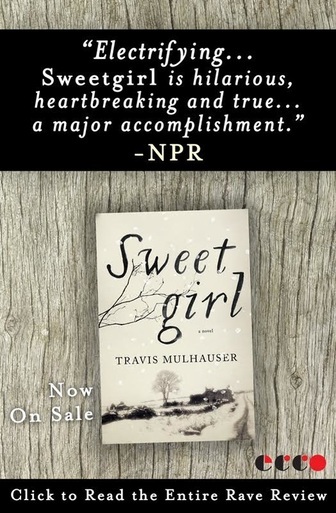 ​Pervaded by the bleak isolation of its setting, Sweetgirl is a moving exploration of the inspiring power of innocence and courage in the midst of desperate poverty - a taut and darkly humorous tour-de-force that is horrifying, tender, and hopeful.